The crude oil delivered to the holding tanks at the refinery is initially fed into the first stage process unit by the Process Charge system. 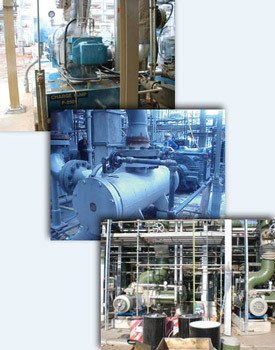 The pumps operating at this location provide the necessary pressure boost to push the crude oil through the Desalter vessel, repeating the process carried out at the upstream facility, then through the super-heated steam furnace and finally into the base of the atmospheric distillation tower. Within this vessel the various components making up the heated process stream are separated due to their different boiling point temperatures and corresponding specific gravities, the denser fluids stratifying in the lower portion of the tower (i.e., heavy gas oil and residual) and the lighter distillates collecting in the upper portion of the vessel (i.e., gas, naphtha and gasoline). These isolated fluids are then individually piped away via a series of horizontal process connections situated at specific elevations on the side wall of the atmospheric distillation tower. Each of these distilled fluids then serves as the feedstock for a subsequent downstream Refining process in which a second Process Charge system is often needed to boost the medium into the unit. When you survey a refinery process flow diagram, it is readily apparent that Process Charge equipment serves as the primary means of introducing kinetic energy into the process stream. 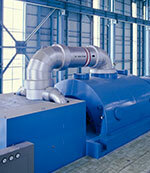 High reliability is demanded from this rotating equipment. 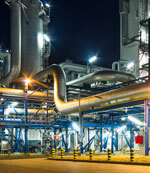 Continuous, uninterrupted operation must be maintained due to the complexity of the facility. 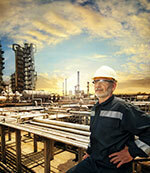 Tight control of flow rates from unit to unit is critical to support the optimum throughput of the refinery. High process temperatures, as well as the handling of harmful, even toxic, process fluids dictates that proven API compliant equipment must be specified and used. Refinery production managers and operators around the globe have experienced the benefits that volumetric, rotary PD pumps can bring to these services. Having one machine that can efficiently transport heavy, medium and lightweight products simplifies the number of pieces of fluid-handling equipment required at these facilities. Controlling the rotary PD pumps with an adjustable speed drive allows operations to be performed in a "timed" manner without the need for flow control valves, eliminating the need for the recirculation of surplus process fluid. This reliable system control method takes full advantage of the tremendous turndown flow range of rotary PD pumps and their inherent high suction lift capability, making them an ideal fluid-conveying solution for your process charge systems.